Black Coolmax Chef Jackets keep you cool in the kitchen when the temperature rises! Designed to draw perspiration away from the body, allowing it to evaporate easier, these black coolmax jackets have a panelled mesh back. With a contemporary wrap around style, coolmax black chef jackets are easy to fasten with their concealed studs. 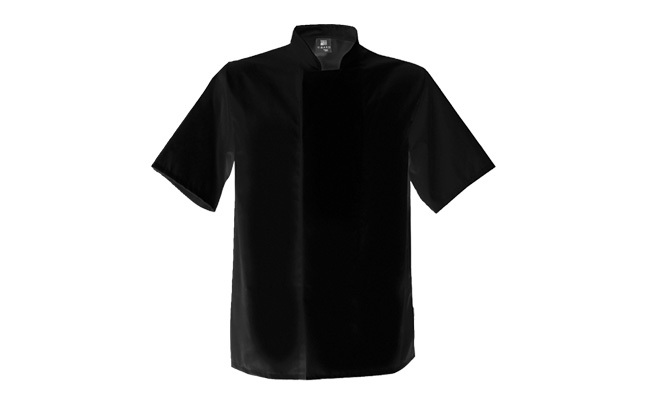 In a soft, easy-care fabric, these black coolmax chef jackets are made from 65% polyester and 35% cotton. Just launder at 50°C to keep clean. So if you get hot in the kitchen choose a coolmax chef jacket to keep your cool! This range of coolmax chef’s jackets are also available in white if you are looking for traditional chef whites but with modern technology! Shop online at Pattersons Catering Supplies for all of the commercial kitchen clothing and uniforms you need from chef jackets to catering aprons and more. Our chef jackets are available with next day delivery or can be arranged for click and collect. Our extensive range of chef clothing includes chef trousers, chef hats and much more catering clothing for the busy kitchen professional.